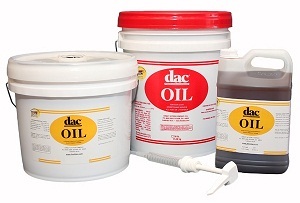 Grain and Seed-derived oil. High in Omega-3 and Omega- 6. 99% crude fat and high in beneficial omega-3 & -6 fatty acids for developing muscles. Provides 2-1/2 times the energy contained in grain. A "must use" if you're serious about fitting up your horses for show or sale. Contains wheat germ oil, flax seed oil, soybean oil, rice oil, corn oil, alpha tocopherol acetate (vitamin E), niacin for absorption, thiamine hydrochloride and folic acid. Naturally and artificially flavored. Stays blended. For all classes of horses. For maintenance, feed 1 oz twice daily.